When the chocolate bunny buzz wore off, the kids played with these clearanced clay buckets from Publix (50-cents). Andrew shared his copycat idea for the Play-Doh Make and Display sets . He simply inverted short plastic cups for domes. Note to self: never underestimate the cool factor of one's own little world. 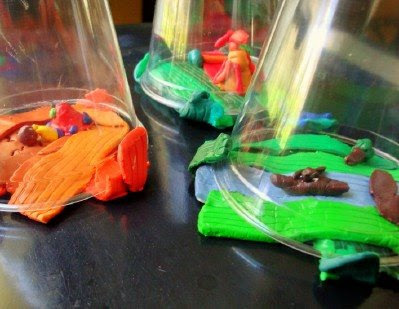 Want more copycat clay play? 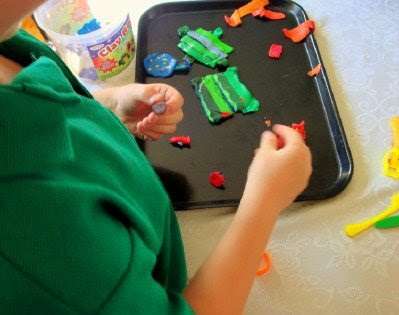 Make & Takes makes play dough placemats. Momadvice packages play dough for gifts. Very fun and cute..my playdough days are farther apart and few...but I love it! I don't know how it is in Nashville, but here in Central Illinois our Rotisserie Chickens that come from a deli, etc. come in a container that looks very similar to the Playdough one in the Amazon link you gave. A rotisserie container might give Andrew a little bit more room to create something neat than just a plastic cup. Just an idea! I think Andrew's are much cooler than those store bought ones. This is such a great idea. I haven't seen the domes, but I don't get out much anymore :). I will definitely be adding this project to my rainy day list. Andrew is very inventive - I wonder where he gets that from:) Levi will love this idea. How cute! We did homemade play dough as Valentine's Day gifts for my daughter's class instead of candy. I've noticed that given the chance - kids will come up with a solution on their own. That's why kids in previous generations had a lot of fun with a lot of nothing. Those are so cute- what an inventive child you have!! Thank you so much for the link to my play dough gifts. They are always a hit at parties! I love to see Andrew's work. That child has a great imagination. I have not seen those Play-Doh make and display sets. My guys like play-doh so I do not know how I missed them. When we play with play doh we do it on the back patio on the plastic (Little Tyke) picnic table. A hose makes quick clean up of the mess. Thanks for the good ideas. I guess I havent seen those domes either. Good job kids on your creativity! Was there a reason why Andrew was not allowed to have the set with the domes? Do you ever buy toys retail at the store or is it your policy to buy ALL toys at yard sales or on clearance? I am curious what others' policies are concerning new toys. Are they for birthdays and Christmas only? Do your children have to save their own money for them? Or do you always purchase used? For me, it is a combination. I am always on the lookout for good, used toys but delight in surprising with a special new toy as well. For one, the Play Doh dome sets are ridiculously overpriced. They are tiny. Secondly, I do not give in to checkout line whining. Thirdly, when given a choice of new toy, Andrew always goes for the Legos. Love this idea! There surely is something magical about one's own little world. I know what you mean about a child whining for something but not choosing it when given the opportunity; I think it is good in letting them learn about trade-offs.